Almost everyone will experience at least one cavity during their lifetime. They are painful, unsightly, destroy teeth and jaw bone and can even make you sick if left untreated. 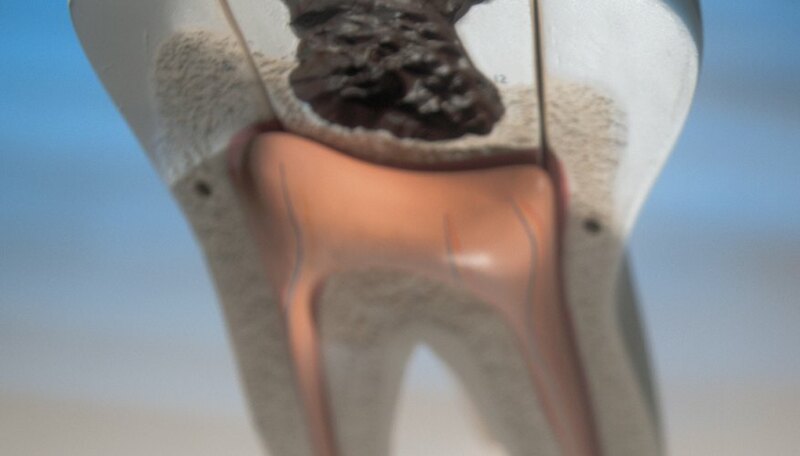 Tooth decay makes an interesting science fair topic that most individuals can relate to. Decay is caused by acid produced by bacteria in your mouth when they eat sugars from your food. Acids are corrosive and they demineralize (dissolve) the teeth, causing pits (cavities) of what dentists call dental carries (decay). You can conduct some experiments on tooth decay and add the results to your science fair display. Try to obtain real teeth for your experiment from a dentist, dental teaching hospital or your classmates with baby teeth that have fallen out; otherwise, egg shells make a suitable substitute. Weigh each tooth or egg shell on an analytical balance. Record your data. Gather several sugary liquids, like apple juice, sugar-sweetened cola and a sports drink, as well as a control of water. Put each liquid into its own labeled baby food jar, test its pH and add one tooth or egg shell to each jar. Wait three to four weeks. Remove the teeth one at a time from the different liquids to examine and weigh. Calculate the difference between the starting and current weight to determine which liquid caused the most damage. With new teeth or egg shells, perform the same experiment as in Step 1, but use acidic liquids. Avoid liquids that contain sugar, so your results are purely based on the acid content, not sugar. Use liquids like vinegar, diet cola, diet lemon-lime and water. As with the first experiment, prepare the jars of liquid by weighing each jar and testing the liquid's pH. Then, weigh each tooth or egg shell and add a tooth to each jar. Wait three to four weeks. Remove each tooth, one at a time, to examine and weigh it. Calculate the difference in the starting and current weights to determine which acidic liquid was the most damaging to teeth. Perform the experiment again, this time using carbonated sugar-free liquids, such as seltzer water, diet cola or lemon-lime and a control of water. Don't forget to put each liquid into its own labeled baby food jar and test the pH, and then weigh the teeth and egg shells, and add a tooth to each jar. Wait three to four weeks. Compare and record the appearance of each tooth with the one in water. Weigh each tooth and calculate the difference in the starting and current weight to determine the effects of carbonation on tooth decay. Find pictures of tooth decay to display. Organize the data from any experiments you conducted, and display the teeth and liquids that were used. Draw illustrations of the decay process and be prepared to explain the chemical reactions taking place. Inform your visitors of ways to reduce tooth decay. Contact a local dentist to see if she would be willing to donate toothbrushes, paste and floss to handout to individuals visiting your science fair project display. Strauch, Annette. "Kids' Science Fair Projects on Tooth Decay." Sciencing, https://sciencing.com/kids-science-fair-projects-tooth-decay-10037628.html. 25 April 2017.